They always called them peeny roses. Elspeth’s big sister Jean looked after them in the sloping ‘L’ shaped tenement garden and that’s what she called them. The O’Haras didn’t bother with their garden on the opposite side of the stairs to the close like Jean did. Jean was an awful lot older than wee Elspeth, she worked but she didn’t stay in the house in Auckland Street. She looked after the house and Elspeth, and liked doing the garden; she was struggling to keep the brambles and weeds at bay. You could see the ghost of where the garden used to be, a gate and wee paths leading around the slopes with a cliff dropping to a hedge at the bottom. The peenies under the windows were the best though, still blooming and strong amid the dark green tangle on the last clear bit of path in the used to be garden. The big beautiful blossoms full of petals should’ve had a lovely perfume but didn’t. Jean let Elspeth and her wee pal Catherine play in the garden once when she was weeding and tidying. She carefully cut two of the finest red peeny roses and gave them one each. They failed to keep them behind their little ears while they were pretending to be Spanish dancers, they held them in front like brides, each wee girl with her very own bouquet. They curtsied low and graciously whilst holding the hems of their frocks out with the other hand- beautiful princesses accepting them from their adoring, imaginary subjects. Kidding on they were fainting they breathed in the pretend perfume from their one-flower posies then fell about giggling at their own exaggerations. In summer cotton dresses, white ankle socks and t-strap sandals, the children pranced about, away with the fairies in a garden labyrinth magicked out of the sleeping beauty briars by the sumptuous crimson richness of the magnificent peenies and their glossy green petals. Elspeth’s house always seemed really dark, Catherine didn’t go in there much. She had never seen such dirty beds, unmade with rough blankets and once-white sheets now grimy black. She didn’t know where Elspeth slept. There was a Daddy around somewhere, sometimes, in the shadows, and a big brother too. They were big gruff Irish building workers in rough working clothes who didn’t speak except to call ‘Elspeth!’ in their deep voices. Catherine wasn’t sure where Elspeth’s Mummy was. It had been a home once, she could make out ornaments on a sideboard, holy pictures on the walls, cold ashes in the living room grate. Jean tidied up when she came, cooked food. Catherine wondered if Elspeth was often in the dark house by herself. Once, Elspeth asked Catherine and some other children to come into the house to play strange games with their bodies. Catherine didn’t want to and ran out. It was dark and horrible in the scabby living room. Jean gradually stopped coming to Elspeth’s house. When Catherine and Elspeth started school they used to look for each other at playtime from their own side of the high fence separating the playgrounds of St. Cuthbert’s and Saracen primary schools. They both quickly made new friends and stopped going to the fence. Elspeth didn’t come out to play down the back much after school. 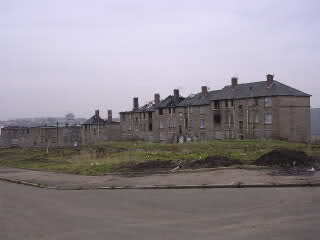 Then Elspeth moved to another house a few streets away in Hamiltonhill – to an ‘intermediate house’. Catherine’s Mummy and Daddy said she wasn’t allowed to go there to play with Elspeth. She used to pass the house often on her way to visit her Aunty Agnes hoping to see Elspeth but she never saw her again. The peeny roses hung on for a few more summers before succumbing to the advancing thorny darkness of the brambles. The new people in the house didn’t rescue them. The garden outside Elspeth’s new house was a flat dirt rectangle. 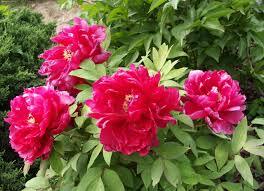 Catherine still thinks of Elspeth when she sees peeny roses – she never calls them peonies.